Create effortless curls at the push of a button with the Diva Precious Metals Professional Auto Curler, a revolutionary hair curler that automatically draws your hair into a curling barrel to create luxurious, bouncy curls. Helping you to create big curls or glamorous waves, the innovative curling tool has a curl chamber that automatically draws in your hair; it softly holds and heats before releasing freshly coiled locks without risk of tangling. 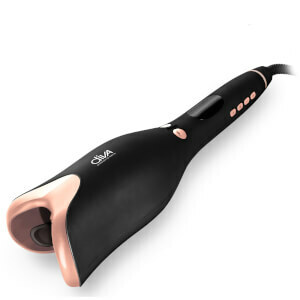 Easy to use, it features an indicator light that prompts you to release hair, revealing instant curls and waves, every time, and has two directional buttons so you can choose whether to create curls shaped towards or away from your face. Professional Auto Curler in Rose Gold. Automatic curl chamber gently draws in hair. Curls at the push of a button. Directional button to manipulate curl direction. Divide the hair into 2cm / 1 inch sections. For tighter curls use smaller sections, for looser curls and waves use larger sections. Starting with the under layers of hair, select a section of hair and place horizontally in the top of the barrel, holding hair at the ends. Ensure the large ‘U’ shaped slit opening of the product is facing away from you. Once hair is in the correct position select a directional button located at the top of the handle. You can choose from two directional buttons, which will create a curl either towards or away from your face. Allow hair to be taken into the barrel smoothly and continue to press down directional button until the barrel stops spinning. Keep hair in the barrel until you hear 4 beeps. Once you have heard the 4 beeps simply pull the barrel in a downward motion away from your head to release the curl. Arrange curl into place with your fingers.